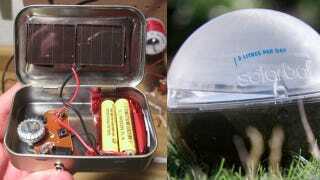 This week on TreeHugger, $3 solar radios made from Altoids tins, crazy mechanical bird mimics seagulls, hack your iPad 2 smartcover to work with the iPad 1, see-through solar powered cell phones and more! While it isn't very green to upgrade a gadget like the iPad just a year after it was launched, those who are lusting after the Smartcover shouldn't despair! There's a way to retrofit it so that it works with the iPad 1. This could be how homes of the future are powered, all with a poker card-sized cell in a bucket of water. The Festo Corporation recently unveiled one of the most lifelike and natural-seeming flying machines that I have ever seen — called the SmartBird, inspired by the flight dynamics of a common seagull. A super-thin transparent screen coating for smartphones that could continuously top off your battery with solar power. It even comes complete with plug-in headphones. VOTE! Best concept gadgets, iphone apps, computers, blogs and more. Amazing Camera-on-Helmet Bike Videos from North Vancouver, British Columbia! These 8 videos are from British Columbia, Canada, and they show all kinds of amazing rides; some slower and very technical, others really fast (the one above is slower, while the A-Line below is fast) with lots of jumps, and some are in wet dirt or snow. Crazy stuff. Designed to help those people in areas that lack clean drinking water,it can produce up to 3 litres—or just over 3 quarts — of clean water every day. Municipalities are loving them because they are inexpensive and help local governments fulfill their responsibilities to cyclists easily. TreeHugger's EcoModo column appears every week on Gizmodo.